“Niall completely refitted and refurbished our bathroom in the spring of 2016. We were at the stage in life where the old bathroom had done its service for us, and we wanted to change the bathroom totally. From the moment we met Niall we were completely impressed with his attention to detail, punctuality, professionalism, care around our home and cleanliness around what was a very messy job (including stripping right back to the brickwork and removing a dusty old stud wall). All of that went hand-in-hand with his personality and character – totally pleasant and agreeable, extremely hard-working, scrupulously honest and up front and a general pleasure to have around our home. Niall just would not let anything less than perfect go for finished. Every detail, no matter how small received full consideration, reflection and attention. If it isn’t perfect, Niall will correct it automatically without having to have it pointed out – he just does not let anything average or inappropriate pass. He dedicated extra time to rounding off and finishing many of the finer points of the bathroom. He is superb at discussing options, sharing the benefit of his experience, offering advice and guiding you in the decisions that need to be taken during the course of the installation. “Niall installed our bath / wet room in 2010. Having been uncertain and previously advised against a wet room on the first floor, Niall reassured us that providing installation is competently carried out, a wet room above ground floor is perfectly acceptable and we have not been disappointed. Niall is meticulous in his preparation, organisation and workmanship. He is a first class craftsman who we would recommend to anyone requiring a high quality job. In 2014 we were looking for a reliable tradesman to retile our kitchen floor. 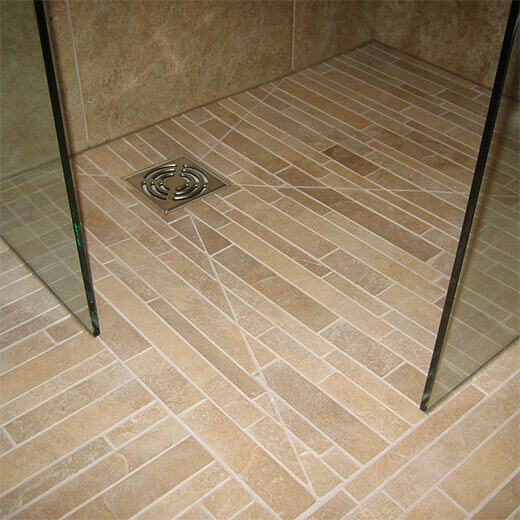 We wanted a job comparable to our tiled bathroom and without hesitation we called Niall. “Niall and his team installed three stunning wet rooms in our house and six years later they still look as if they were finished yesterday. His skills in finish and detail are second to none. We heard of Niall from friends who were delighted with their bathroom and couldn't recommend him highly enough. We had to wait nearly four months to contract Niall as he was so busy but as we looked elsewhere in Southport, we realised he was worth the wait as he stood far ahead of his competition in enthusiasm, thoroughness, confidence and designs of our wet rooms. He answered all our concerns, and there were many, especially about leaks from wet rooms and allayed all our fears!!! We gave Niall the go ahead, paid our deposit, and from start to finish of the installations Niall and his team were utterly professional. We have had not one complaint or issue with our wet rooms in six years and we think that speaks volumes of how well they were installed. He is no ordinary tradesman, we think of him in the highest regard! “Over several years and three different jobs, Niall has fitted a wet room and separate shower room for us and created a downstairs WC out of thin air. He has proven himself to be unfailingly helpful, polite and respectful, with a discerning approach to the job which produces work which is always finished to an exceptionally high standard. “Over the last four years we have asked Niall to undertake three projects at our property. The first work was a total refurbishment of our Bathroom including a new bath and shower. This was completed to the highest standard and then Niall undertook, in partnership with other contractors, a design and installation of a large Kitchen and Utility. As well as Niall utilising his undoubted professional individual trade skills the Kitchen refurbishment also involved Niall project managing the total work by organising all other contractors to ensure the finished Kitchen and Utility was of outstanding quality. Earlier this year in 2015 Niall then completed a luxurious en suite Wet Room which he again designed and we find it absolutely stunning and it is a pleasure to regularly use the facility especially with the heated floor being an extra bonus! The tiling on all the work done by Niall is without doubt exceptional. The fact that we have asked Niall to undertake three separate and very different projects shows that we really value his work and indeed he is meticulous in his attention to detail and always discusses the job and specifications both before and also during the installation phase. He sets himself exacting high standards and perhaps an indication and measure of his work is that it gets my wife’s nod of approval as she is always thrilled at the finished rooms! Website and photography © 2016 Niall Brannigan Wet Rooms & Bathrooms.Site by BBD.